In the midst of WWII two St Andrews students came together to produce a series of film magazines. Robert Smart Edwards, aged 19 at the time, studied the arts; while William Rollo Mitchell, aged 20, studied the sciences. They took up the project during an intra-fighting period, while on leave from their studies for WWII service. Due to these circumstances, the publications were produced at Edwards’ home address, 20 Primmer Place, Cowdenbeath. The magazines were handwritten on plain, stapled, paperback notebooks. Monarch News, the first title, ran for twenty-two issues, from February 1943 until May 1944. It was produced on a bi-monthly basis throughout 1943, and then as a monthly magazine in 1944. It was largely dedicated to Edwards and Mitchell’s film production, And So Goodbye, which they began working on in September 1942 (Monarch News, January 1944, 3). In order to write about their own production – as the producer and the director of And So Goodbye – the pair adopted nicknames. Edwards wrote under the name of the Sceptre, while Mitchell wrote under the name of Bo-Peep. The magazines largely followed the conventions of the more established film publications of the time. They included film and theatre reviews, short stories, interviews, crossword puzzles, glamour shots, reader letters, and even art spreads and musical supplements. 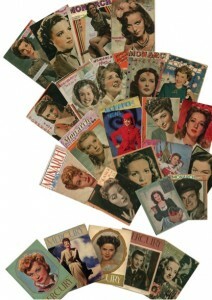 Some of the interviews and glamour shots were produced for their own production, while others were pulled directly from other film publications, such as Picturegoer, Modern Screen, Motion Picture and Silver Screen (see for example, Picturegoer, Dec. 1943, Picturegoer and Film Weekly, Nov. 1940, and Modern Screen, July 1942). The issues varied in length, sometimes running as short as eight pages and sometimes well exceeding the length of wartime publications. For example, the Christmas/New Year Issue of Monarch News (No.17) reached an impressive 47 pages. The issue price started out at 2.5 pence, but took a leap to 6 pence in January 1944, although the annual subscription remained constant at £4 a year. The money was largely used to buy film stock for the society. It is not entirely clear as to how wide the readership of the magazines was; however, they were circulated through several households in Fife by mail. What he called “Mitchell’s wild schemes” appear to be his plans for the public distribution of And So Goodbye, which Edwards opposed. Ultimately, Edwards formed Mercury Film Productions and began writing Mercury, this time on his own. It is not entirely clear as to how long Edwards ran Mercury, but it is safe to assume that it ran at least until December 1944. Edwards graduated from St Andrews in 1950 with an MA, while Mitchell graduated in 1947 with a BSc. The two did not go on to make careers in the film industry; however, both went on to have teaching careers and both stayed involved with theatre. Mitchell’s son, Robin Mitchell, went on to make a 24-minute documentary about their production, which came out under the same title of And So Goodbye and was shown at various film festivals. The efforts of the duo show just how rich the cinema culture amongst St Andrews students was and how it could flourish at the most unlikely times.